High, Low Magnesium Levels Linked to Dementia Risk - Medscape, 9/20/17 - "those with low magnesium levels (defined as 0.79 mmol/L or less) and those with high levels (0.90 mmol/L or greater) had significantly increased risk for dementia at an 8-year follow-up assessment ... As serum magnesium levels are not routinely measured in daily clinical practice, our take-away message is to consider measuring these levels in patients at risk of hypomagnesemia ... This includes those who are taking proton-pump inhibitors or diuretics and those with a diet lacking in green vegetables, nuts, and whole grains — "as these foods are rich in magnesium."" The effects of phenylalanine on exercise-induced fat oxidation: a preliminary, double-blind, placebo-controlled, crossover trial - J Int Soc Sports Nutr. 2017 Sep 12;14:34 - "Oral intake of phenylalanine caused a significant increase in the concentrations of plasma glycerol and glucagon during exercise. The respiratory exchange ratio was also decreased significantly following ingestion of phenylalanine ... These results suggested that pre-exercise supplementation of phenylalanine may stimulate whole body fat oxidation. No serious or study-related adverse events were observed" - [Nutra USA] - See phenylalanine at Amazon.com. A randomized, multicenter, double-blind study to evaluate the safety and efficacy of estradiol vaginal cream 0.003% in postmenopausal women with dyspareunia as the most bothersome symptom - Menopause. 2017 Sep 18 - "Lower-dose estradiol vaginal cream (0.003%) dosed three applications/week is an effective and well-tolerated treatment for VVA-related dyspareunia"
Total Antioxidant Capacity from Dietary Supplement Decreases the Likelihood of Having Metabolic Syndrome in Korean Adults - Nutrients. 2017 Sep 22;9(10) - "The prevalence of MetS was lower in dietary supplement users (odds ratio (OR) = 0.82; 95% confidence interval (CI), 0.68-0.98) than that in non-users. Among dietary supplement users, a lower prevalence of MetS was observed in the highest tertile for vitamin A (OR = 0.72; 95% CI, 0.53-0.99) and vitamin E (OR = 0.74; 95% CI, 0.55- 0.99) intake than that in the lowest tertile among non-users. Subjects in the highest tertile of TAC among dietary supplement users showed a lower prevalence of MetS (OR = 0.72; 95% CI, 0.52-0.99) than non-users. The results imply that intake of vitamin A, vitamin E, and TAC from dietary supplements might have a protective effect on MetS among Korean adults"
Metformin Has Positive Therapeutic Effects in Colon Cancer and Lung Cancer - Am J Med Sci. 2017 Sep;354(3):246-251 - "Metformin (MF), a diabetic drug, has antineoplastic activity as adjuvant therapy for breast cancer and prostate cancer. MF is thought to work via inhibition of mammalian target of rapamycin and activation of p53 and liver kinase B1 via adenosine 5'-monophosphate-activated protein kinase ... For CC, the MF group noted fewer deaths (48% versus 76%, P < 0.001), recurrences (4% versus 19%, P = 0.002), metastases (23% versus 46%, P = 0.001), better 5-year survival rates (57% versus 37%, P = 0.004), overall survival years (5.7 versus 4.1, P = 0.007) and greater carcinoembryonic antigen decrease (72% versus 47%, P = 0.015). MF was associated with improved 5-year survival rates (29% versus 15%, P = 0.023) and overall survival years (3.4 versus 1.8, P < 0.001) in LC" - See metformin at The Antiaging Store. Treatment effects of Ginkgo biloba extract EGb 761® on the spectrum of behavioral and psychological symptoms of dementia: meta-analysis of randomized controlled trials - Int Psychogeriatr. 2017 Sep 21:1-9 - "Ginkgo biloba extract EGb 761® has been found to be effective in the treatment of behavioral and psychological symptoms of dementia (BPSD) ... Four trials involving 1628 patients (EGb 761®, 814; placebo, 814) were identified; treatment duration was 22 or 24 weeks; the daily dose of EGb 761® was 240 mg in all trials. Pooled analyses including data from the full analysis sets of all trials (EGb 761®, 796 patients; placebo, 802 patients) revealed significant superiority of EGb 761® over placebo in total scores and 10 single symptom scores. Regarding caregiver distress scores, EGb 761®-treated patients improved significantly more than those receiving placebo in all symptoms except delusions, hallucinations, and elation/euphoria. The benefit of EGb 761® mainly consists of improvement in symptoms present at baseline, but the incidence of some symptoms was also decreased" - See Ginkgo biloba at Amazon.com . Antioxidant intake from diet and supplements and risk of digestive cancers in middle-aged adults: results from the prospective NutriNet-Santé cohor - Br J Nutr. 2017 Sep 20:1-9 - "This prospective cohort study with quantitative assessment of supplemental intakes suggests a potential protective effect of several antioxidants (vitamins C and E and Se) on digestive cancer risk, and a modulation of some of these relationships by alcohol consumption and smoking status"
Blueberry supplementation attenuates microglia activation and increases neuroplasticity in mice consuming a high-fat diet - Nutr Neurosci. 2017 Sep 21:1-11 - "supplementation of a HFD with blueberry reduced indices of microglia activation and increased neuroplasticity, and these changes may underlie the protection against memory deficits in HFD-fed mice supplemented with blueberry" - See blueberry extract at Amazon.com . Medical Definition of Neuroplasticity - medicinenet.com - "The brain's ability to reorganize itself by forming new neural connections throughout life. Neuroplasticity allows the neurons (nerve cells) in the brain to compensate for injury and disease and to adjust their activities in response to new situations or to changes in their environment"
Olive Component Oleuropein Promotes β-Cell Insulin Secretion and Protects β-Cells from Amylin Amyloid-Induced Cytotoxicity - Biochemistry. 2017 Sep 13 - "oleuropein promotes glucose-stimulated insulin secretion (GSIS) in β-cells. The effect is dose-dependent and stimulates the ERK/MAPK signaling pathway. We further demonstrated that oleuropein inhibits the cytotoxicity induced by amylin amyloids, a hallmark feature of type 2 diabetes. We demonstrated that these dual functions are structure-specific: we identified the 3-hydroxytyrosol moiety of oleuropein as the main functional entity responsible for amyloid inhibition, but the novel GSIS function requires the entire structure scaffold of the molecule" - [Nutra USA] - See olive leaf extract at Amazon.com. Oral hyaluronan relieves wrinkles: a double-blinded, placebo-controlled study over a 12-week period - Clin Cosmet Investig Dermatol. 2017 Jul 18 - "Sixty Japanese male and female subjects aged 22-59 years who presented with crow's feet wrinkles were randomly assigned to the HA 2 k or HA 300 k at 120 mg/day or the placebo group. The subjects were administered HA at a rate of 120 mg/day or a placebo for 12 weeks ... During the study period, the HA groups showed better level of the whole sulcus volume ratio, wrinkle area ratio, and wrinkle volume ratio than the placebo group. After 8 weeks of ingestion, the HA 300 k group showed significantly diminished wrinkles compared with the placebo group. Skin luster and suppleness significantly improved after 12 weeks in all groups compared with the baseline" - [Nutra USA] - See hyaluronic acid at Amazon.com. Here are two better options than I put out last week for raising the alkaline level in your drinking water. The water pitcher option was worthless. Best case it raised the pH by 0.4. The test strips were also worthless. I'd go with a gauge. At least it made sense. I went with the filter below and put it between my reverse osmosis and the reverse osmosis faucet. 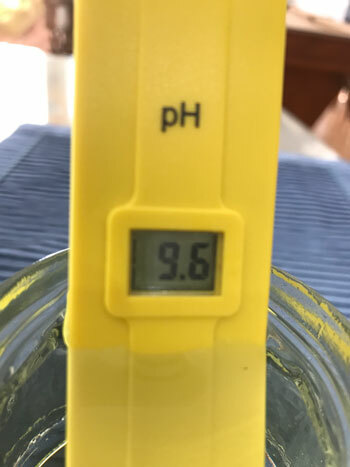 It got the pH up to 9.6.